Timed and Precision 1 (T&P1) used to be known as Police Pistol 1 (PP1) which the police used to train with. Multi Target (MT) was originally known as Service Pistol and was used by the Military. As all disciplines were based around a service revolver; all instructions to load are in 6’s and still are to this day. These disciplines were very popular in the days of Pistol shooting. Now they have been modified to suit our Gallery Rifles and Long Barrelled Revolvers (LBR) or Long Barrelled Pistols (LBP). The Club takes part in the Phoenix competitions which contain many shooting disciplines based around pistol calibres. The disciplines are derivatives of Police and Military practices. We shoot centrefire pistol calibre rifles which take between 9mm and .44 magnum rounds as well as long barrelled pistols - firearms with barrels over 30cm and over 60cm overall length. 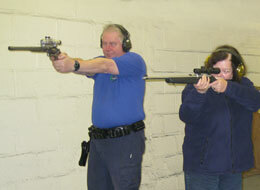 Our competitions for gallery shooting are precision and timed using multi-targets. Practice 1 is at 25 meters, you have 2 minutes to shoot 12 rounds to include your reloading. Practice 2 is at 15 meters. The targets will turn away for 5 seconds and face you for 2 seconds. During the time it is facing you, you will have to fire one shot. When the target is not facing you the rifle should be at 45 degrees. The targets will turn 6 times. This practice is fired twice. Practice 3 is at 10 meters. The target will make 3 appearances of 3 seconds. Two shots are to be fired at each appearance. 30 shots are fired with a maximum score of 300. Practice 1 is at 25 meters. 6 shots in 15 seconds on left hand target. Practice 2 is at 20 meters. 6 shots, 3 on each target in 10 seconds. Practice 3 is at 15 meters. The target will make 3, 2 second appearances with intervals of 5 seconds. 2 shots to be fired at each appearance on right hand target. Practice 4 is at 10 meters. 6 shots, 3 on each target in 8 seconds. 24 shots are fired with a maximum shore of 120. Common rifles manufacturers are Winchester and Marlin, mostly semi automatics and underlevers, which are fed by magazines. We also shoot .22 Ruger 10.22 clones. As a rough guide, a new rifle costs in the region of £400 - £800; a pistol £700 upwards. You can enjoy shooting these competitions with the basics being just the firearm and perhaps a scope for a rifle. But as with every sport there is a mountain of paraphernalia that you can incorporate to aid you’re shooting. Most shooters will have their gun belt with pouches to carry their magazines or loops to carry their ammunition if they are using an underlever. You would normally carry enough ammunition on your person to complete the detail (Max 30 rounds). Please note: any manufacturers, equipment and opinions detailed above are for information and guidance only and are not recommendations by Portishead Shooting Club.